Cambridge, MA. Many of you have patiently read and commented on my posts in the past four years, and I appreciate your interest. But most of you I've not met, and you've had to rely on the written word. But on Friday, April 20, there is a chance for more. If you are in the New York area and would like to come for a Hindu-Christian spiritual and theological conversation of which I am part, you are invited to Columbia University on Friday at 4pm, Earl Hall Auditorium, 116th Street and Broadway: Encountering God: Hindu and Christian Perspectives on Going Deeper into Spiritual Experience. 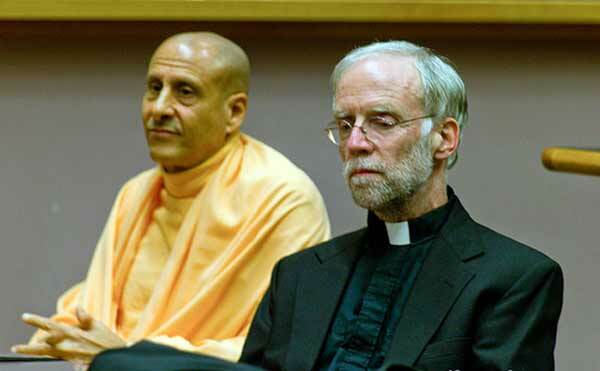 I will be in conversation with a senior monk and devotee of the International Society for Krishna Consciousness, Radhanath Swami, on a variety of spiritual and theological issues. My most dedicated readers with the best memories will recall that about three years ago, I commented on his book, The Journey Home: Autobiography of an American Swami . I also welcomed him at a student event at Harvard several years ago, hence the picture with this blog. He and I are the same age (61), and responded in our own ways to the 1960s and our vocations as we understood them then and over the decades. So the conversation will surely move back and forth from the larger issues to our personal stories. It will be chaired by Professor Edwin Bryant, a well known scholar of Hinduism and professor at Rutgers University. Blessings on you (both) and your efforts to find God. You look convincingly ascetical and cerebral and may I say Jesuitical for me to give further weight to your words in future. Good luck with the conversation let me know when you are swinging by Paris.